Turns out I’ll be joining my lovely colleague Deirdre Angenent, an all-star Korean cast and the Bucheon Philharmonic Orchestra in a concert performance of Tannhäuser at the Seoul Arts Center in South Korea. What a nice surprise! Looking forward to seeing Seoul, working in Asia for the first time professionally and singing one of my absolute dream roles in the process. Thursday, 30th June 2016 at 7:30pm. I’m thrilled to be taking part in a dynamic new production of the Flying Dutchman in Singapore at the Victoria Theatre. The Richard Wagner Association of Singapore, together with OperaViva and the Finger Player are responsible for the production, in which I’ll take on the role of Senta. It will be directed by Chong Tze Chien and Glen Goei, and conducted by Darrell Ang. What to expect from a Dutchman with a south-east Asian Twist? Well, word on the street is shadow puppetry and other elements of Chinese opera, and that the set will be inspired by a kelong (fisherman’s village on stilts). I think it sounds amazing and I can’t wait to see the concept. Senta is not a new role, I made my debut in Sondershausen in 2013 with Marcus Frank at the baton and Toni Burkhardt in the director’s chair. It’s a wonderful, thrilling opera and the role is a personal favourite. I can’t wait! I got a call one otherwise boring Friday afternoon to see if I could jump in the following evening in the Hessische Staatstheater Wiesbaden’s production of Elektra. 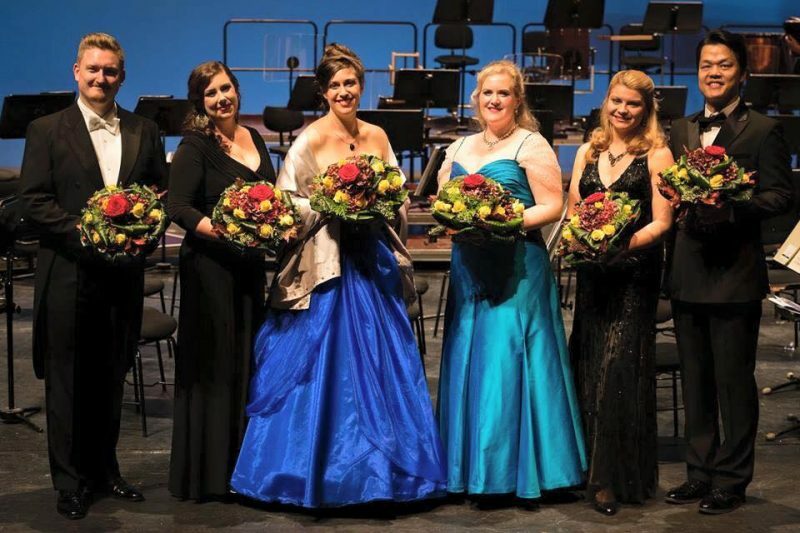 I sang the role of the fifth maid five years ago in Cologne and Uwe Eric Laufenberg, the then Intendant, has since moved to Wiesbaden to shake things up around there. How exciting! I jumped on a plane early the next morning and arrived just in the nick of time for a super quick costume check. 90 minutes before the curtain went up, I got 5-10 minutes on stage with the other maids… it’s a small role but the fifth maid gets her own mini-aria, so it’s a great little showcase. The other gals were super friendly and the staging was pretty easy to get under my belt, so that whole process took 7 minutes. The next step was a quick musical rehearsal with the conductor, Vassilis Christopoulos – just to be sure we didn’t meet each other on stage for the first time. That rehearsal took all of 3 minutes, and then it was already time to get my face on. It went like a dream and then it was all over! Thrilled to meet old friends from Cologne (Stella An, Young Doo Park, Wolf Mathias Friedrich, Dalia Schächter, Catherine Foster and of course, Uwe Eric Laufenberg). I was also particularly happy to meet fellow Aussie singer, Celeste Haworth. Celeste showed me around and we had a ball backstage. Gerne wieder, sag ich nur! I’ll be singing an evening of song for the Richard Wagner Association in Dortmund in September this year. Joining me on keys is Jonathan Ware. The programme is not yet set in stone, but it’s looking like Brahms, Berg, and Wagner. I’m excited to be revising some old favourites (the Wesendonck Lieder) and also getting stuck into some yet unexplored territory. A seriously awesome evening at the Baadisches Staatstheater Karlsruhe. Thanks to the staff at the Theater, the Richard Wagner Verbände in Karlsruhe and Berlin, and to the enthusiastic audience for cheering so unbelievably loudly and then almost unanimously voting for me! I’m ready to get out there and get singing again after taking almost 2 years off to raise my lovely baby daughter. I am stronger and fitter than ever, and I wonder if the results of this competition might bring some exciting projects my way. Let’s hope so. I am open for anything, universe! The finalists were all in terrific spirits backstage and we had a lot of fun, which was refreshing – competition vibes are not always quite so jovial. So thanks, finalists, and here’s to antipodean singers bringing it! (Ms. Sharpin is a Kiwi).